1.d4 d5 2.c4 c6 3.¤f3 ¤f6 4.¤c3 e6 5.Ґg5 h6 6.Ґxf6 Јxf6 7.e3 ¤d7 8.Ґd3 Ґd6?! The last move is not good. The main continuation here is 8...dxc4 9.Ґxc4 g6 with an unclear position. 9.O-O dxc4 10.¤e4 Јe7 11.Ґxc4. One does not have to capture a bishop. After 11.¤xd6+ Јxd6 12.Ґxc4 O-O the position simplifies and it is hard for White to prevent b7-b6 and c6-с5. Black has a solid, but passive position. His play consists in preparing c5 or e5 and in activating a light-squared bishop. 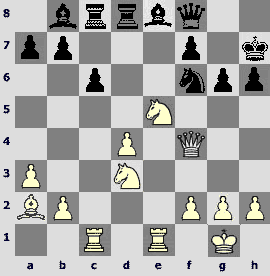 It is difficult to prevent White to carry out both, therefore, one has to prepare for an opening. 12...O-O 13.Ґb3! Preventing 13...b6 and 14...Ґb7. 13...¦d8 14.Јc2 ¤f6 15.¦fd1 Ґd7. In case of 15...¤xe4 16.Јxe4 Ґd7 it is followed by 17.¤e5 Ґe8 18.f4 with a strong positional bind. 16.¤c5 ¦ab8 17.a3. A useful move. White prepares the move b2-b4 and moves the light-squared bishop on the diagonal b1-h7. 17...Ґe8 18.Ґa2. 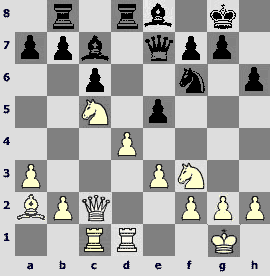 18.¤e5 looks active, but after 18...b6 19.¤a6 ¦bc8 20.¤xc7 ¦xc7 White does not have time to prevent с6-с5. 19.Ґb1? After 19.dxe5 ¦xd1+ 20.¦xd1 Ґxe5 21.¤xe5 Јxe5 22.¦d4 b6 23.¤d3 Јe7 24.b4 White has a small advantage. Not bad was also 19.b4. During the game it seemed to me that 19...e4 was threatening, but after 20.¤d2 Black loses the central pawn. 19...exd4 20.exd4 g6. At this moment I decided that the passive bishop on the e8-square is a good defender, and I could not press on the black king straight away. 21.¦e1 Јf8. Worthy of consideration was 21...Јd6. The position is rather equal. 22.Ґa2. An acknowledgment of a mistake. The bishop has nothing to do on b1-h7diagonal. 22...ўh7 23.Јd2. White defends the central pawn and prepares the queen to move on the kingside. 23...Ґd6. Stronger is 23...¤d5 24.¤e5 Јg7 with an unclear position. 26...Јg7. Unsuccessful would be 26...¤d5 27.Ґxd5 ¦xd5 28.¤xg6! Ґxf4 29.¤xf8+ ўg8 30.¤xf4 ¦xd4 31.¤8e6 with a great advantage. 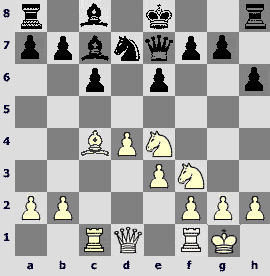 Worthy of consideration is 26...¤h5 27.Јe3 ¤g7 28.d5 ¤f5 with an unclear position. 27.Јe3 (with an idea of ¤f4) 27...¤d5 28.Јh3 ¦c7. In this position the value of every move is extremely high. I try to create threats with each move, because Black has only to play f7-f6 and then Ґd7, and there will be no sign of initiative of White. 29.¤c5 ¦e7 30.Јh4! Now one cannot play 30...f6 because of 31.Ґxd5 cxd5 32.¤g4 ¦xe1+33.¦xe1 g5 34.Јh3, and White wins. The most principled continuation is 30...Јf6. But then 31.Јxf6 ¤xf6 32.¤xf7! ¦xe1+ (32...¦xf7 33.¦xe8! ¦xe8 34.Ґxf7 ¦e2 35.b4 ¤g4 36.Ґe6) 33.¦xe1 ¦xd4 34.g3 b6 35.¦e7 bxc5 36.¤d6+ ўh8 37.¤xe8 ¦e4 38.¦xe4 ¤xe4 39.Ґb1 ¤d2 40.Ґxg6 Ґe5 41.b4 with better chances, however, the most probable outcome is a draw. 30...g5 31.Јe4+ ўg8. One cannot play 31...ўh8 because of 32.Ґxd5 cxd5 33.¤g6+. 32.Јf5 Јf6. This is the decisive mistake. Black does not endure the tension. One should play 32...Ґxe5, though, of course, it is a pity for Black to give such a bishop. 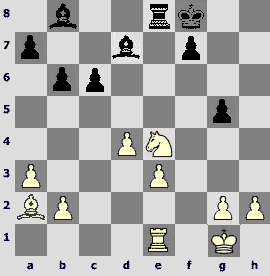 33.dxe5 b6 34.¤d3 – White is in a better position, but the whole struggle is ahead. 33.¤g4! It is a pleasure to make such moves. Black has obviously missed this knight's thrust. Now the material losses are inevitable. 40.¤f6! After this move the struggle is almost finished. One could have played also 40.¤xg5 Ґf4 41.¤h7+ ўg7 42.¤f6! ўxf6 43.¦f1. 40...¦d8. In case of 40...¦e7 the easiest thing is to play 41.¦c1 winning the second pawn. 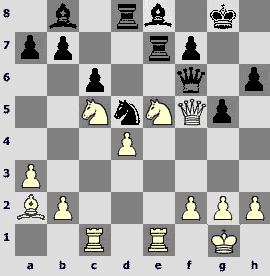 41.¦f1 ўg7 42.¤h5+ ўh6 43.Ґxf7 c5 44.¦f6+ ўh7 45.Ґg6+, and in view of 45...ўh8 46.¦f7, Black resigned.